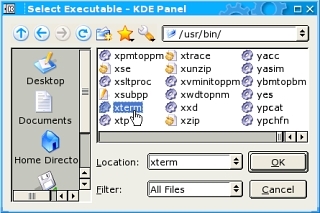 KDE (which runs on various flavours of UNIX, Linux and the BSDs) is particularly flexible in the way that it interfaces with the user. It can be made to have much of the look and feel of various types of Windows and Mac interfaces. 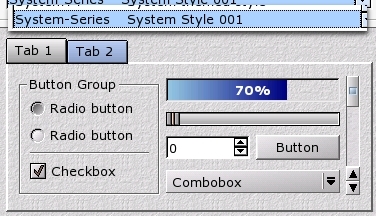 However, where in Windows, you change between various GUI styles (in XP, that's blue, green and silver or over to the processor lighter Windows 98 look), there are actually two parts to the interface that are quite easy to confuse. 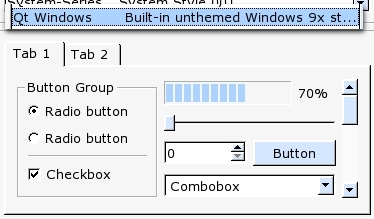 First of all, there are the window decorations (the title bar with its label, icon and buttons and the borders - effectively the 'bits' around the outside) and then there are the other parts of the windows (the form background, buttons and other objects and so on). In Windows, they are separate and if you have had the right type of crash in Windows XP, you will have seen either that the window decorations fail but the rest of the system keeps on working or, that the program crashes and the window decorations keep on working. These two types of crash are the only time that you might think that the two are separate. 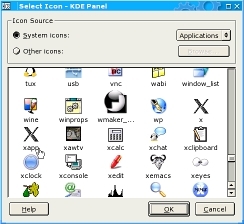 In KDE and other UNIX-like-environment GUIs, you will see that they are separate and that you can change them independently of each other. So, let's go through some of the different aspects of the GUI and see how we can change them and what we can do with them. First of all, fire up control centre and click on 'Appearance & Themes'. 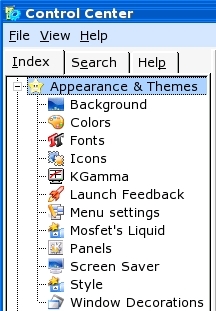 Here, you will find many different sets of options that you can play around with - if giving Windows 95 users the choice of changing colours and fonts for that interface wasted millions of man-hours, this is going for the record. Under Window Decoration, you will get a list similar to that on the right (under the 'General' tab). You can select one and either see a preview of it or, failing that, click on the 'Apply' button in the bottom right hand corner. This is a composite (it would have to be) of some of the window decorations that are available. You can see that the close button is (in these cases at least) always a cross and the minimize and maximize buttons always indicate their meaning. You will also notice that there is another button (apart from the menu button) that looks like a notice board pin or a circle (usually). This is the sticky (or depth) button and it is a toggle (that is to say that click on it once and it turns on: click on it again to turn it off). This button allows a window to appear on all of the desktops simultaneously which, as you get used to the idea that a GUI need not be claustrophobic, might well become increasingly useful (depending upon what sort of work you are doing). 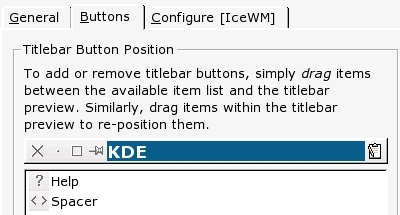 The Ice Window Manager (IceWM) is a proper window manager in its own right but SUSE (and probably others as well) allow it to be part of KDE. 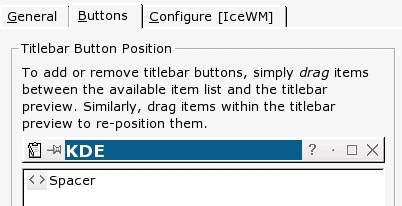 You can download IceWM themes or write your own (see HelpDesk in issue 208 for more details on how to make your own) and use them on your system. If you want a Windows XP version, you can either find one to download or take screen shots (one with an active window and one with an inactive window) and make your own XP theme from that. At the bottom of the General tab sheet, you have some general options. 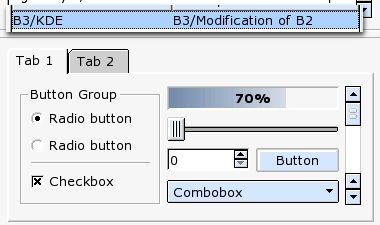 If you click on 'Use custom titlebar button positions', you will be able to use the 'Buttons' tab. Under the 'Buttons' tab, you can now drag and drop the titlebar buttons to where you want them. 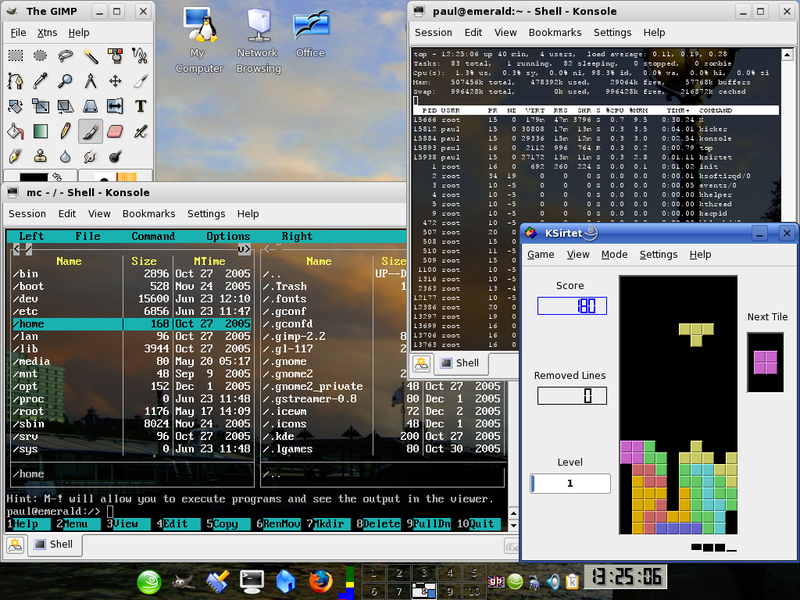 In this screenshot, from left to right they are: menu; depth/sticky; help; minimize; maximize; and, close. To change them around, all you need to do is to drag and drop them. Here, I've made the order: close; minimize; maximize; sticky; and, on the right: 'menu'. Of course, on Mac's Aqua interface, there is no sticky button because there is only one desktop. However, on the Aqua interface the buttons are red, yellow and green so it seems obvious to have a blue one to make a pretty rainbow (of sorts). And, here it is: red for close; yellow for minimize; green for maximize; and, blue for sticky. A lot prettier than the Aqua interface. 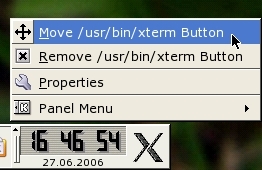 One difference between Windows and KDE is what happens if you double-click on the title bar. 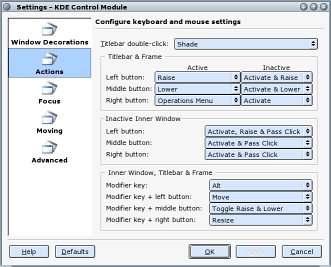 In Windows, the window will maximize but in KDE, it will shade. You can see from the two screenshots on the right that this is like grabbing hold of the bottom edge and dragging it all of the way up to the title bar in Windows. However, this is better than that in that if you double-click on it again, it goes back to its original size. Right-click on the titlebar and you will get a menu similar to this. Click on 'Configure Window Behaviour...'. You will now get a form like this one - you can see that this is a lot more configurable than Windows. The Windows decorations dialogue is the form that we have already used to select a windows decoration but we want 'Actions'. 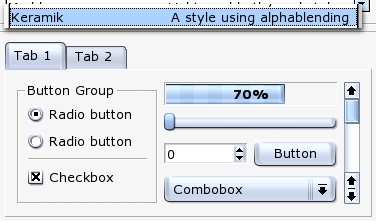 At the top, there is the 'Titlebar double-click:' dropdown box. Click on that and you will get a choice similar to that on the right. 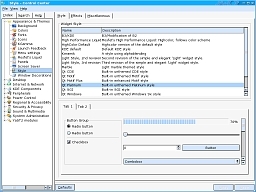 To change to maximize, select maximize and when you click on 'Apply' or 'OK', the behaviour will be the same as in Windows. One other useful feature is border-snapping. 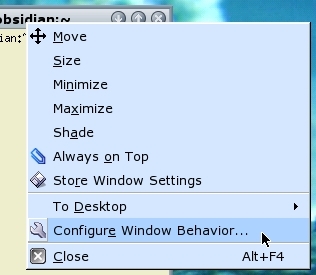 On KDE, the default action is that when you are moving a window around the desktop, when it gets within a certain range of another window or the edge of the screen, it will move itself up to that edge. This makes placing windows on the screen very easy as you don't end up with them overlapping or with gaps in between them - you end up with the most efficient use of your desktop. 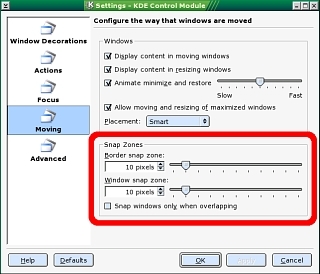 You can change the snapping distance (how close to another window you need to get for this effect to occur) on the 'Moving' panel. The style is the other part of the window - the inside. 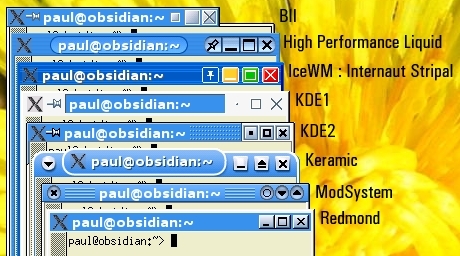 In Windows XP with the blue borders, the style is analogous to the pale yellow bit inside. In Control Center, under 'Appearance & Themes', select 'Style'. On the right, you can see a screen shot of the panel you will get (or something close to it as KDE evolves). In the 'Widget Style' list box, you can see a list of all of the styles that you can choose from. There are quite a few and if you are trying to get an interface that is fairly close to the one that your user population is used to, you should be able to achieve this. As you look down the column of different styles on the right, one thing that you will notice is that the controls all look pretty much the same as each other. The sliders all have a track of some sort with a button or knob on it; The radio buttons all have the same general appearance as each other as do the check boxes. The end users can see how these work on these interfaces just as easily as they can see them on Mac OS X or on Windows - there is no effective difference. Users who are new to computers take just as long to get used to the KDE interfaces as they do to get used to the proprietary ones. 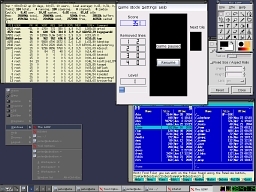 This penultimate example down the right hand side is Qt Windows which is a fairly good representation of a Windows 95/98 interface. 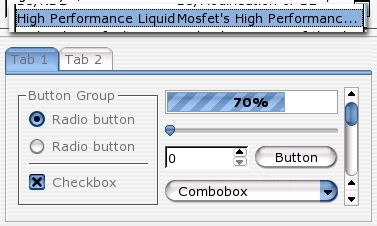 This last example is Mosfet's aqua interface which should satisfy those nervous about upgrading from a Mac environment. You can, of course, change the colours with KDE (as you can with any of the interfaces). There are already a number of colour schemes installed and there is nothing to stop you from coming up with your own. 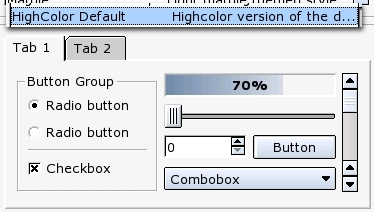 If you select part of the scheme using either the dropdown combo on the right (here, saying; 'Standard Background') and then click on the elongated button below it, a colour selector will appear. Just choose a colour in the usual way and click on 'OK'. You can take a screenshot or use an image and then use the colour picker to take a sample of any specific colour you need. 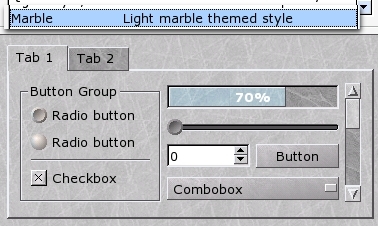 If you choose 'Desktop', 'Panels' (under different versions of KDE, this might be in a different place but basically, you want a screen similar to the one on the right), you see the options for the panels. The panels are the equivalent of the 'TaskBar' in Windows. However, they are far more flexible and can also be transparent. For one thing, you can have more than one of them and their positioning is more flexible as well. 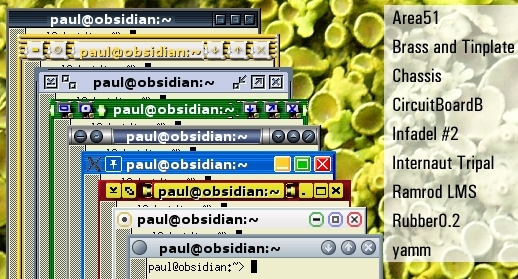 You can also mix them with other types of panel such as an external taskbar. You can also choose sets of icons, download additional sets or even make your own. 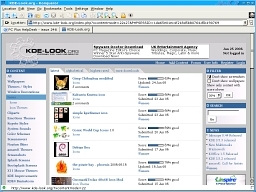 This is KDE Look org's site - there's always plenty going on there. The fonts that you use will change the way that an interface appears to the user. 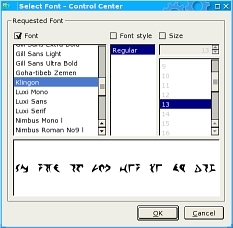 You can save the Microsoft core fonts for free - the license permits this - if you want to use those fonts. Of course, there is nothing to stop you using a 16th Century Italian Cursive font, Gill Sans Serif, Times or even Klingon (if you have the localisation set for it). There are plenty of backgrounds for you to choose from - many on the Internet. If you want something specific, you can usually find it. The backgrounds (wallpapers) that the proprietary manufacturers produce are usually a bit of a cliché by the time you are looking at migrating away from their operating systems so the thought of infringing some obscure section of a EULA by copying them over shouldn't even enter into your head. The Background section in Control centre allows you to have a slide show if you want, a different wallpaper on each desktop or a mixture of the two. 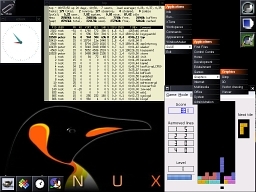 KDE is not the only window manager that will run on UNIX-like systems. Choosing one depends upon various criteria such as how confident your users are, how much memory you have to play with (remember that Linux and other UNIX-like OSes will run on a fraction of what Windows XP needs to run on), the speed of the machine (again, you can run the OS on quite a low spec machine compared to Windows XP), how much disc space you have and so on. At the risk of starting a flame war, KDE is the easiest to use and most fully-featured of the common UNIX desktops. 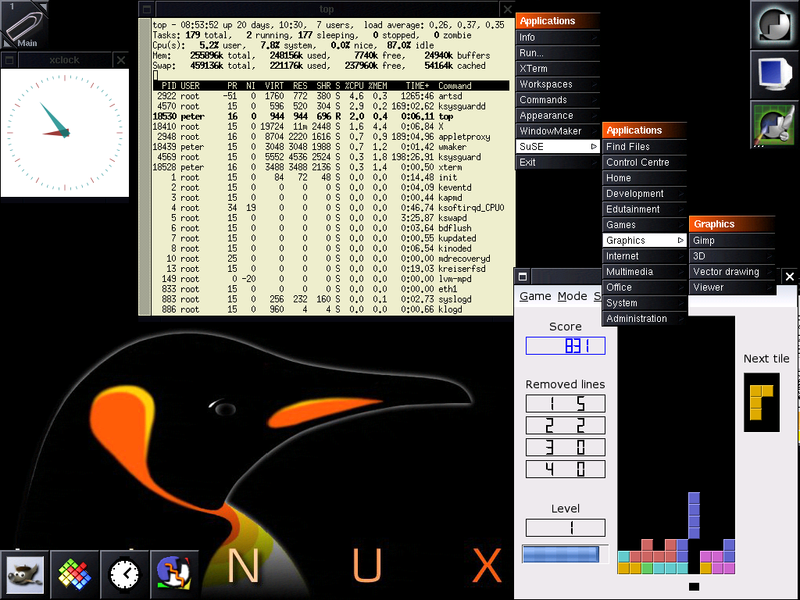 I've run it on Linux and various BSDs and it is very flexible. You can make it look and perform like just about any other GUI you want and it supports transparency as you can see with the panel across the bottom and the Midnight Commander window. There are plenty of games for it and OpenOffice.org and the GIMP will run without any problems. Burning CDs is extremely easy using KIIIB and there are plenty of other programs as well. KDE will also run Gnome programs. 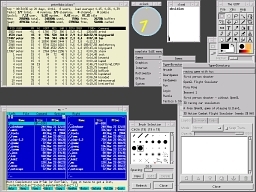 Running in and designed from the outset for a multi-user, networked environment, the UNIX-like OSes allow KDE to run many network management tools such as Ethereal and so on. Gnome also runs well, has a fully-featured and easy to use interface and, as a warning, people are passionate about Gnome. Gnome has a sense of style that KDE has not got but by choosing to go down that path, it has lost some of the flexibility that KDE has. Again, network management and office/graphics support is excellent and Gnome has little if any trouble running KDE programs. 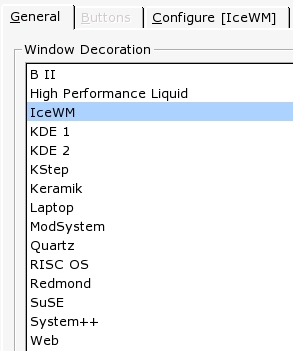 The Ice Window Manager is beautifully lightweight - taking only around 2 seconds to load on a 1.8GHz machine. Again, you have access to all of your favourite programs including the office and graphics programs. In addition, there are literally dozens of different themes. Window Maker is another lightweight widows manager and to get to the menu on this, you click the mouse anywhere on the blank screen. 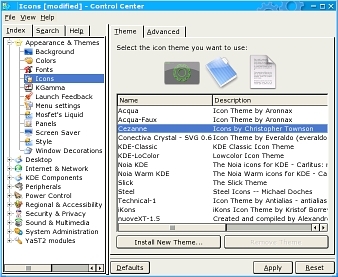 Again, there are dozens of different themes and you have access to your programs - in this case, you have the SUSE menu to go in addition to the WindowMaker menus. BlackBox is very lightweight and menu access is via a mouse click. Again, SUSE menus are accessed through this and you can use the same programs as mentioned above. Just when you thought that BlackBox was lightweight, think again. Menu access is the same as above. This is not the most lightweight though as some essentially just provide a graphical means of accessing more than one terminal at the same time. For the beginner, I would recommend KDE. 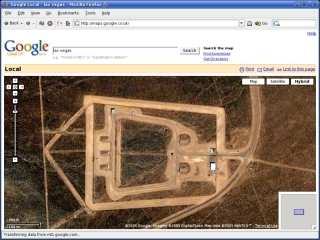 Google Maps allows you to see satellite images of just about anywhere on the planet in whatever resolution is available - or, at least a reasonable one. 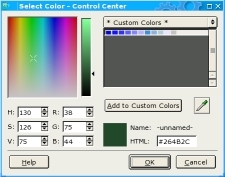 The site is at http://maps.google.co.uk/ and if you have the right browser, it will display cornfield profanities, flying cars and much more - possibly ending up as even more of a waste of time than the initial Windows 95 option for the user to change the colours in the GUI. A plug-in is not the answer until Google Maps becomes stable (ie, gets out of 'beta') and you would essentially have to update the plug-in each time Google changed anything. So, which browsers does it support? Which web browsers does Google Maps support? Ideally, your best bet is to install one of those browsers. If you have a web server on your LAN and the server is visible from the Internet, you will have a route from your firewall to your server. If you are running Apache or some other, easy-to-configure web server, you might have multiple virtual hosts as well. But how do you make sure that they are all working properly? If the server acts as a bridge to the Internet - that is, you have only one machine acting as a filter and server - your LAN machines will have access to it via its IP address or the machine name. External users connect to the Domain Name Server (DNS) which gives them the IP address of your firewall and the request is then routed to your server. The problem is that if you use one of your domain names, your browser will ask the external DNS and you will get your firewall's external IP address and the process will most likely fail. If you have your own, internal DNS, the solution is to have an entry in it with the address of the server linked to the domain names it uses. However, if you have not got your own, internal DNS, you cannot do this. Also, putting the domain names in the 'hosts' file doesn't always work. Alternatively, if your server is in the DMZ, you will have a route to that from the LAN but again, the DNS points at the external address on the firewall. DeMilitarised Zone - okay, I know that is 'DZ' but the Americans like TLAs (Three Letter Acronyms of which TLA is itself one). A DMZ is a third zone on a firewall (a tri-homed firewall - one with three network connections on the back) and in effect, it is where a server will end up being attacked if it is going to be. However, any attack on it will not intrinsically compromise the LAN as that is separate (you can make it compromise the LAN but you have to work at it, not merely work with it). So, this is for people who either don't have a DNS of their own that they can play around with, don't have the time, or, are too lazy. One way of doing this is to go into your browser's configuration panel (here, Konqueror's) and change the proxy configuration so that instead of looking at the proxy (in the first of the two diagrams above, that would be 10.12.216.254 and on port 8080, 3128 or similar), it looked at the external NIC (in this case, 192.168.0.20) on port 80. That way, you can type in the URL and the server will give back the page from the virtual server that you want. This is on Internet Explorer 6 running on Windows 98SE. In the second case (where the server is running on the DMZ), you would again look on 192.168.0.20 on port 80 although here, there would be no proxy for normal use (you can always have one on your LAN and run your web server on a DMZ). However, the problem is that changing the browser configuration and then changing it back afterwards is quite a lot of hassle. If you just want to check that changes to links and file references work all right, you could do with a quicker, temporary solution - one that you don't have to undo afterwards. 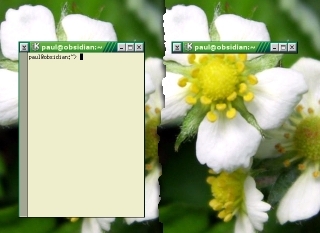 Links is one browser that you can change at the command line. If you use the -http-proxy switch along with an address and port number in the form a.b.c.d:p where p is the port number. This is not the default virtual host on the server but using links like this checks that all of the file links work all right. In theory, you can take an image of the moon that has been taken during daylight and cancel out the light from the sky - this is effectively just an extrapolation of what happens at night except that the amount of light from the sky is a lot less at night so you don't notice it. In fact, your eyes take out a lot of the light if you look at the moon during the day. The magnitude of the light during daylight only really makes itself apparent when you use a device like a camera - this not having advanced image (edge detection) processing built into the image before it is passed on (in the case of the eye: to the brain, in the case of a camera: to the memory chip). 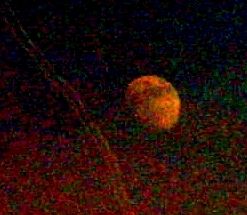 In the image on the right, you will just about be able to make out the moon. Here is why it is so difficult to see. 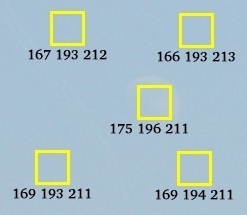 There are only 13 levels of density (value) that represent the image of the moon. We can go to each layer (red, green and blue) one at a time and expand the left and right density markers so that they match the densities of each layer in turn. If you do that, you will get an image like the one on the right. The first thing you will notice (assuming that we are ignoring the contrail that has become apparent - East Midlands Airport was downwind of the place that this was taken from so aircraft were flying towards me) is that there is a lot of noise in the image. This is due to the fact that we have expanded such a short range of densities to cover the full range in this photograph. Another thing to notice is that we haven't cancelled out the blue sky either. Let's look at where this noise is coming from and see if we can do anything about reducing the level of background 'blueness'. This is the red part of the image. The sky is blue so in the red layer, the sky is darkest. You can see that the sky is a lot lighter here and in comparison, the contrast between the moon and the sky is a lot less. Here, there appears to be little if any difference between the sky and the moon. 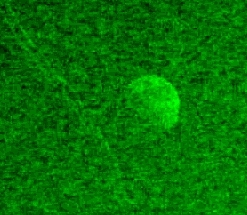 If you were presented with just this image, you might think that there is something like a section of a round object there - from the way that the JPEG image changes the noise in it at the moon's limb. This is the monochrome image derived from the red and green images but you can still see a lot of background light from the sky. However, you will notice that this is a gradient. The sky produces a gradient but taking a value away from the whole image is like taking a flat colour from the image. 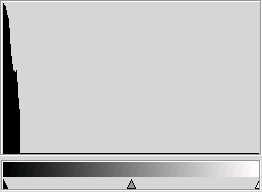 So, let's try taking values and then subtracting gradients from the image. Here are the values (R, G, B) for each of five areas. These are taken as an average over a 32x32 pixel block for areas either side of the moon and just to be complete, we have taken one for the moon as well to demonstrate just how little it stands out. 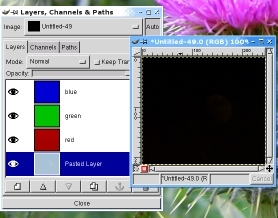 Here, I've added three gradients in the rough direction of each of the red, green and blue layers in the image above. The reason I have used full range gradients is so that I can see where they are. Now, we narrow the range for each colour so that it has the correct limits - the limits for the sky, not the sample from the moon. 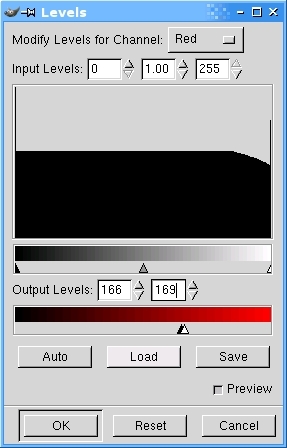 You can see how narrow they are by looking at the output limits (166 to 169, ie it has a range of four values). Here, you can see that each gradient looks fairly flat. Now, the image has all of the right amounts taken off it (well, as best we can do considering the image in the first place). You can see that it looks black. And here is why. We need to expand this up to the full range. Here it is with the values expanded. 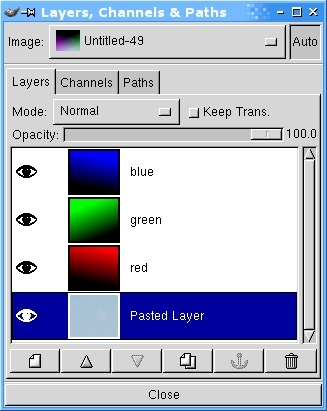 This has each layer expanded so that the blue in the image reaches a maximum as well as the red and green in the image (remember that there was no appreciable detail in the blue layer). and then make it a grey scale image. 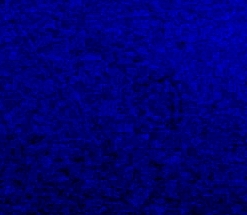 Note that here, there is still a gradient of background noise although this appears to be a step - this happens when you have a gradient over a small density range. One way of getting rid of this is to start off by expanding the density range of the image so that it is a lot wider than the original. If you do this, when you subtract a gradient from it, you will have more steps and if they are fine enough, you will not see any steps (or at least, not very easily) when you put the gradient in. This is an artefact of only having 8 bits per layer per pixel - if it was 16 and RAW, there would be no JPEG artefacts and the lower limit to the dynamic range would be defined by the sensor instead of the image file format used (remember that these cameras are designed so that people with little understanding of computers can process the images on a Windows PC). It is possible to find out what proportion of the system's resources is used by a particular program by using top. 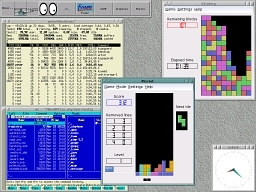 Here, we are looking at ksirtet which is a tetris game for KDE. 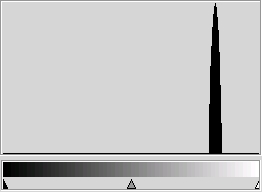 We can see it (PID 22146) and that it has used a total of 2.59 seconds of time. However, top give you the data from the process as it runs. We can get more information about the process once it has finished. In the ksirtet program above, I launched it using a program called 'time'. Once ksirtet has finished, time prints out the total elapsed time that the program has run from when it started to when it finished (in this case, 393.62 seconds or 6m33.62s), the amount of user time (2.44s) and the amount of system time (0.34s). If you add up these last two times, you get 2.78s which is reflected in the time that top came up with when it was running. 'top' has the advantage that you can see what a program is doing in real time but it has the disadvantage that you cannot interrogate the system once a process has finished. On the other hand, 'time' only tells you what happened once the process has finished. Just in case you wondered what the '-p' switch was about, it makes the output conform to a portable operating system interface (POSIX) standard. On the right, you can see the output of a game of tetris without the -p switch and another game with it. There are many different effects that you can use to 'enhance' a photograph but the best photographs are those that were good to start with - even before the image was consigned to the camera's memory. If you are out in the middle of nowhere and you have your trusty camera with you, you might not have any definite plans to take any pictures - just taking it along with you in the extremely rare case that you need to capture the moment when the Zeta Reticuleans land for their buckwheat pancakes or that butterfly you think might be almost as alien needs a photograph taking of it ... or whatever. Any way, you might take a small tripod with you like the one on the right so that if the light levels are low, you can at least have some chance of taking a photograph without any great amount of blur. However, these tripods are rather light and even with a small camera, they are a bit wobbly. The image on the right is some bird seed taken close up in low light levels. As a result, the camera is still moving as I take my finger off the shutter release (maybe 'push button' would be more appropriate as there is no shutter to release). Here, you can see the result of using a delayed shutter release. In this case, it was 2 seconds - the shortest that this camera has. 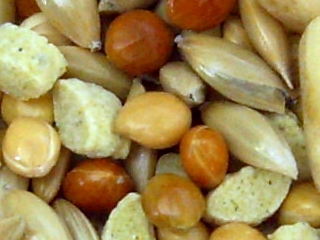 The image is a lot clearer and you can now see that this is bird seed. The seeds are around 1.5mm across and you can see the that they are in fact quite shiny. If you are going to use your Windows 98 box for network- or file-storage-related activities, you might want to keep an eye on what it is up to. You can do this using its System Monitor program. Look under 'Start', 'Programs', 'Accessories', 'System Tools', 'System Monitor' or similar - you might well have moved it since you got the machine. If you cannot find it there and have no idea if it the link is even on the machine, look under 'C:Windows\' for 'Sysmon.exe'. When you have located it, right-click on it and select 'Create Shortcut'. Next, drag the shortcut into your 'Start' menu and drop it where you want it to go. Once you have it going, you need to add some charts to it. Next, you see the 'Add Item' dialogue box. Click on the categories on the left and the items will appear in the list on the right. You can highlight more than one item at a time by holding down [Ctrl] whilst clicking on the items. However, this only works one category at a time. Once you have finished, click on 'OK'. After a while, it will look similar to the screenshot on the right. There are plenty of controls to play around with and you will soon get a feel for which ones are of use to you. You can alter the update interval quite easily by clicking on 'Options', 'Chart...'. The slider takes you through 1, 3, 5, 10, 30 seconds, 1, 5, 10 minutes and 1 hour. When you close the program, the items that you selected will be saved and next time you load the program, they will be there again. First of all, right-click anywhere on the icon populated part of the panel (not menus) or, if your panel is not overly full, on a blank bit of panel. 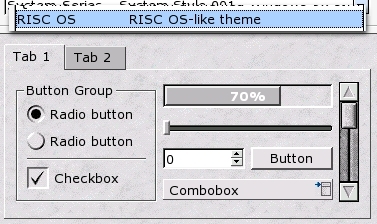 Click on 'Panel Menu', 'Add', 'Special Button', 'Non-KDE Application'. You next get this dialogue box inviting you to find your file. Files are usually in /bin, /sbin, /usr/bin or /usr/sbin. You can also find them in your home directory - /home/paul/bin for example. Next, you get this little dialogue box inviting you to add arguments to the command line and specify whether or not you want it to run in a terminal. Here, instead, we are interested in changing the icon so click on the icon button. Now, you get to choose from system icons for any of the groups of applications actions and so on. If you have one of your own, you can point it at that. You can make one quite easily with the GIMP and remember that you can make them transparent. Just look at those already on the system. Once you have selected your icon, you see it in the button on the right and you have your last chance to edit any command line options before you commit. You can always edit these later on by right-clicking the icon and editing its properties. Once you click on 'OK', it appears in the panel that you originally right-clicked. Here it is with icon zooming enabled. If this is not quite the right place for you, you can easily move it. Just right-click on the icon and select 'Move ...' as in the screenshot on the right. You can now slide it along the panel until it is where you want it. 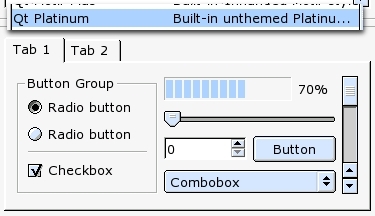 Note that you don't have to keep the mouse cursor on the panel to do this as the icon tracks the mouse movements. Once you have it in the correct place, just click the mouse - again, this does not have to be on the panel (if you have panel hiding enabled, the panel might disappear but clicking the mouse still moves it in the same way that it would have if the panel was visible - just move the mouse where the panel is so that it becomes visible again as you would if you were using it normally). And here it is, with icon zooming enabled. if you have rebooted after taking out a drive that is checked automatically and have been dumped at the command prompt (because the system can't find a drive that it thinks it needs) and need to edit /etc/fstab or a similar file. 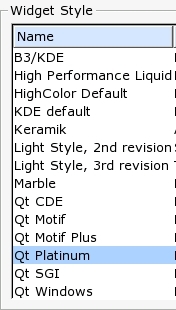 Whilst vi is quite complex and there are other programs (see below) vi is one that is very likely to be on a system and whilst it can be daunting the first time you use it, for simple text editing, there are only a few commands in vi that you need to know. Ideally, you should have a play around with vi and get used to the way it works. If the first time you use it is in a real situation, you will be at a disadvantage. You should now see your fstab file similar to the one on the right. For the reason that it needs to be compatible with situations where arrow keys and some other keys are not accessible, some functions need to use normal character keys. As the program needs to know whether you mean to insert a letter 'h' or move one character to the left, it needs a way of telling the difference and it does this by using two different working modes: command mode and insert mode. Navigate around by pressing the left, down, up and right arrow keys but, should you find yourself on a terminal that doesn't support them, use 'h', 'j', 'k' and 'l' respectively. The 'H' and 'L' keys ('h' character and 'l' character) speak for themselves as they are at the left and right extremes of the four keys. As for which is up and which is down, think of the 'J' ('j' character) as pointing down and you will be all right. Note that like UNIX, vi is case-sensitive so whilst 'l' takes you one character to the right, 'L' takes you to the beginning of the last line of the file. To delete a character, just press the [Delete] key or 'x': to delete a complete line, press 'dd'. To change from command mode, to insert mode, press 'i' or 's'. Now, each character you type will be inserted where the cursor is, just like in KWrite or even Notepad. To get out of insert mode and back into command mode, press the [Escape] key. To insert a new line from command mode, press 'o' and a new line is inserted after the cursor -- you will also be in insert mode ready to start typing. If you were already in insert mode, just press [Enter] for a new line. To replace a line, press 'C' from command mode and then type away until you press [Escape]. So, now, we can insert and delete lines and characters and all we need to do is save and quit. To save, get into command mode and then press ':'. The cursor will move to the bottom. Now type 'w' and vi will save the file, overwriting the original. If you want to save it as, say, 'newfile.txt', just type ':w newfile.txt'. To quit without saving, type ':q!'. The exclamation mark forces the quit without saving first. You'll need to do this to rescue yourself from a situation where you make a monumental mistake from which you cannot recover but you haven't yet saved. In this case, just quit out of vi and then go back into it again. Pico and Pine are two handy little programs that originate from the University of Washington (in the USA, not the original Washington in the UK). Pine allows you to create and read email and Pico allows you to edit text files. Both are lightweight and will work via a remote, text-only terminal. Pine is a small application that allows you to access your email remotely. You can work your way through your email directories, reading them as you would with any mail reader. and the program will open up displaying the address headers, inviting you to add a carbon copy address, attachment and a subject to the email - you can add to the categories using one of the control functions listed at the bottom of the screen. If you take the cursor down to the message text, you can edit it but unlike sendmail, you can go back through it and change other lines as well as the header information. Once you have finished, just use the control functions to send it. If you pick up the mail using your regular graphical mail browser, it will have all of the usual headers (as well as the message, of course) and looks just like any other email. However, if you look at the Message-ID section, you will see that it is prefixed by 'Pine'. If you just enter 'pine' on the command line, you will get the mail reader. This presents the menu on the right and will allow you to configure it for sending and receiving emails. The program is fairly easy to navigate although there is a lot that can be configured if you are going to need to use this as your only mail program. This is how an HTML email looks on pine (which is pretty much the same as it does on any properly configured email browser - remember that you should, for security purposes have HTML email switched off). As this doesn't format the text (remember that it is not a GUI program), any security breaches involving this program would have to come from another direction. You can see why HTML email is deprecated. Pico is a simple, lightweight text editor and if you have this installed, you can use that to edit /etc/fstab file if you want. Remember that Pine and Pico both use the control key for commands whereas vi does not. I have tried Pine and Pico over an SSL link from Windows using PuTTY and there are no problems with the way that the control key is transmitted. However, if there is a possibility of ending up with a link that will only use unmodified keyboard characters (ie, not [Ctrl], [Alt], [Meta], [Win/Tux] and so on) then you need to learn how to use the very basics of 'vi' (see above).